YO!‘s Chindogu Menu is back! – Art, Food, Travel and Fashion! YO!‘s Chindogu Menu is back! 26th March 2018: Glasgow and Manchester get your selfie poses ready, Chindogu is coming! Due to unprecedented demand from YO!’s fans on social media, the Japanese sushi and street food favourite, is introducing the art of Chindogu, “useless inventions”, to two new cities next week following a knock-out launch in London and Newcastle earlier this month. If you’ve ever suffered from burning your mouth on your ramen’s steaming hot noodles, or a messy curry sauce stain down your white shirt? YO! has a useless gadget to fix that! Chindogu, the brainchild of 72-year-old Japanese inventor Kenji Kawakami, are gadgets to solve everyday issues that aren’t usually thought to be worth solving. Home of the quirky and forward thinking, Japan has created many gadgets over the centuries. Those who have made the Chindogu Hall of Fame include the ‘Train Nap Cap’, to keep commuters from slumping on someone’s shoulder mid-sleep, and the ‘Baby Mop’, to ensure parents’ floors are sparkling clean as their babies crawl along. The now much-loved, bestseller selfie stick was even deemed a useless gadget back in 1995 after making it into the book, 101 Useless Japanese Inventions. YO!’s limited Chindogu menu pairs each gadget with their perfect dish accompaniment to give diners a unique eating experience they never even realised they needed. Order YO!’s delicious Dumpling Miso Ramen noodles and see how the ‘Noodle Splash Guard’ stops your luscious locks getting dipped in broth. If you’re a messy eater, look no further than the ‘Napkin Hat’ who will be your best friend at keeping curry stains at bay. To keep your hot Spicy Seafood Udon from burning your lips, the ‘Noodle Cooler’ gadget will cool down noodles just before they reach your mouth with its electrical fan. Test out the range of YO!’s other wacky gadgets when you order from the Chindogu menu. To experience the Japanese art of Chindogu, head to YO!’s Manchester Arndale and Glasgow Central restaurants. 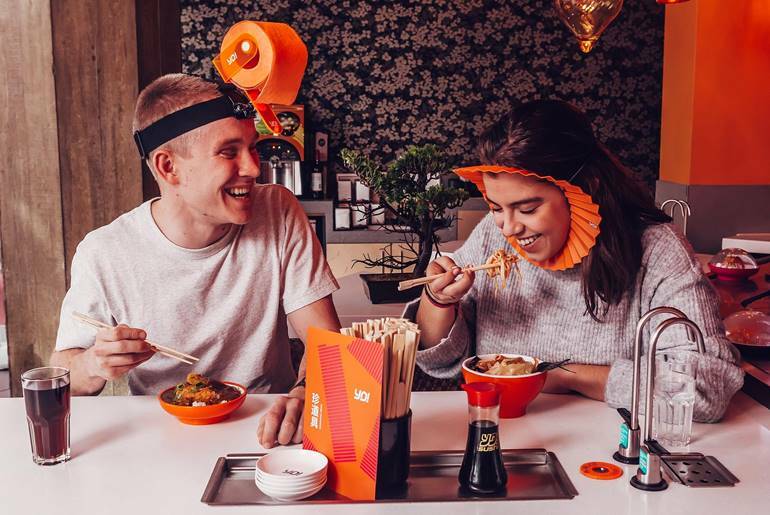 From Tuesday 3rd to Sunday 8th April, when you order off the Chindogu menu you’ll be served up a unique Japanese gadget invented by YO! – useful or useless… you decide!